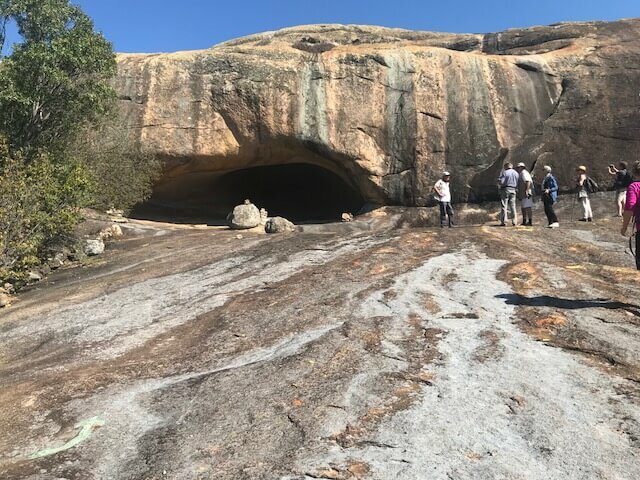 TARA’s David Coulson recently visited and recorded new rock painting sites in Zimbabwe as well as revisiting sites he had recorded over 20 years ago. 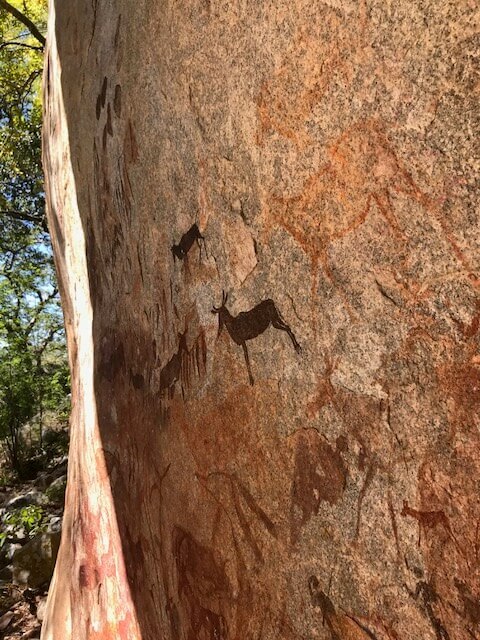 The expedition was made possible by a rock art Safari guided by David that was organised by Pierre Jaunet of Catalina Safaris at the beginning of May this year. While some of the sites were sites already documented by TARA in the 1990s, and more recently in 2016, David was also able to document two remarkable shelters that appear to be little known and only rarely visited. 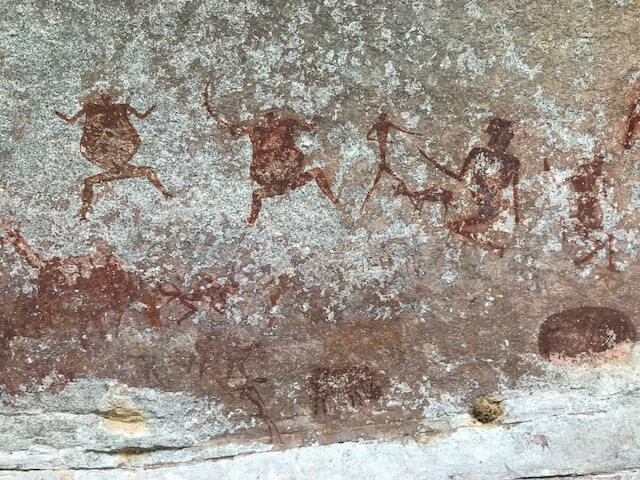 Zimbabwe’s rock paintings (Bushman/San paintings) are some of the most interesting and remarkable on the African continent, and some are thousands of years old dating to well before the Bantu people’s migrated southwards from central Africa. The art is amazingly diverse involving a lot of complex people scenes and a lot of geometric symbols as well as a multitude of animals. On an academic and scientific level TARA collaborates with the National Museums and with the University of Zimbabwe. MANEMBA This site was reached by walking for a couple of miles from where we left the landrovers through semi arable land with patches of undergrowth and occasional baobabs to the base of a huge granite mound ably 500 feet high and about a mile long. 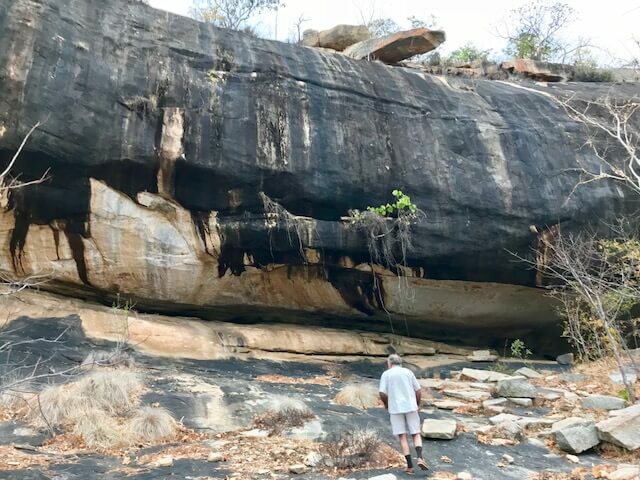 These hills are regular geological features in Zimbabwe and are known locally as “whale-backs” as they resemble the smooth grey backs of those ocean giants emerging from the deep. Climbing steeply up the granite slope we could see above us two long, low caves, like giant eyes, half way up the mountain, and were aware that one of these was probably the rock shelter we were looking for. As it turned out it was the upper shelter that was the painting site – about 70 metres long but only around 10 metres deep. All along the back of this were hundreds of red, black and orange paintings, none of them particularly big, but some of them beautifully drawn and very detailed. There was a line of the most beautifully painted Buffaloes I’ve ever seen, each animal about 35 cms long, several magnificent looking warriors with head dresses and quivers full of arrows and several elephants and lions. There were also a number of depictions of shamans in trance. In that the available living area beneath the shelter was not at all deep I suspect that this may gave been a ritual rather than a living site. The paintings were probably at least 2000 years old and maybe older. CHAREWA The second “new” site we visited (Charewa) which I had never heard of or seen in any rock art publication was an even bigger shelter, perhaps 100 metres long, near the base of another granite whale-back, full of hundreds of beautiful paintings including a number of huge, in some cases life-size, elephants, mostly white. Meanwhile in the centre of the shelter’s rear wall was a huge long yellow animal facing right, perhaps 3 or 4 metres long. 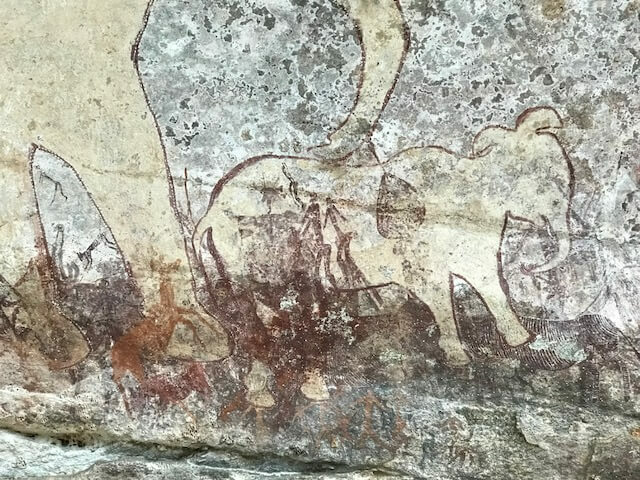 The creature had short legs and most resembled a hippo, generally regarded by the Bushmen (San) as a powerful rain animal, meaning that it was believed to have the power to bring rain. 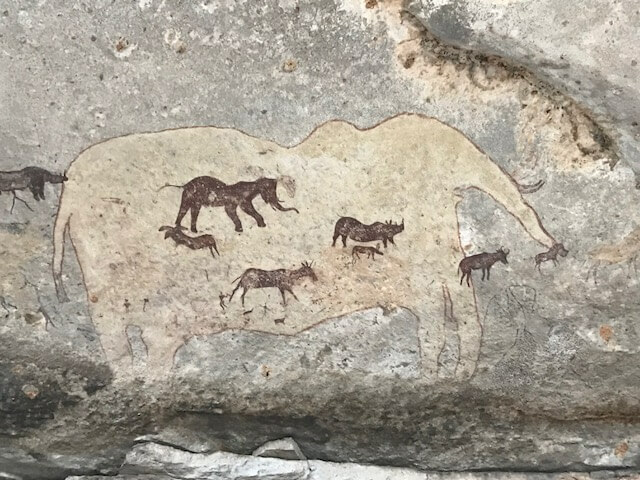 At the left end of the shelter were two cream coloured elephants, near life-size, with dark outlines, and painted over their bodies were a number of beautiful smaller infilled paintings of antelope, buffalo, giraffe and elephant. In my experience this site is one of the most important bushman sites we have recorded anywhere in Southern Africa.